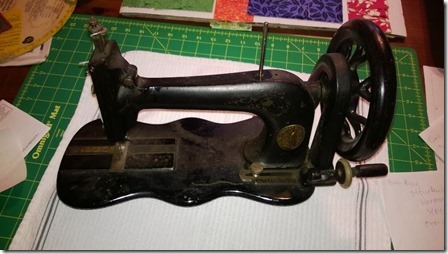 Posted on July 28, 2015 by Julie / This entry was posted in Vintage Sewing Machines. Bookmark the permalink. I have been sewing almost my whole life. 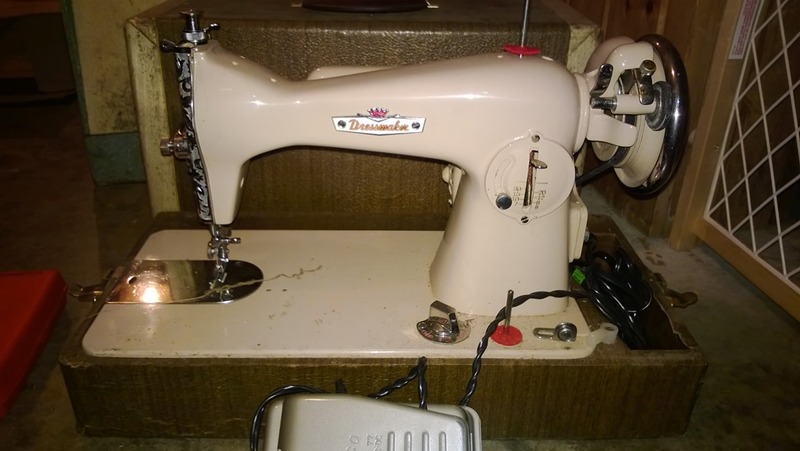 I learned to sew on a treadle sewing machine that my mother had which belonged to my grandmother. On this old sewing machine, I used to make doll clothes and small projects for my younger sister and I. 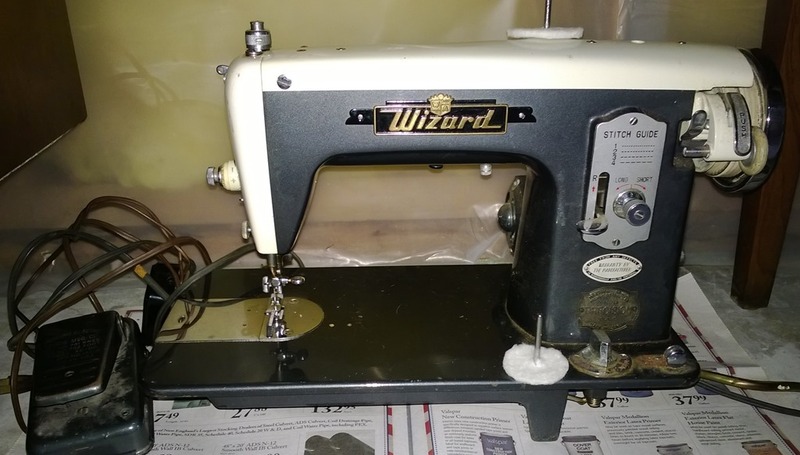 When I was teenager in the 70’s and my skill had developed considerably, my mom bought me a brand new Singer Stylist 534 Sewing machine. I remember how I marveled at this new, electric machine with settings not available to me on the old treadle – a zigzag stitch in varying widths, needle position setting, a reverse button, and most important of all, presets for making buttonholes. At some point in time, the treadle sewing machine disappeared from my mother’s house and I never gave any thought to it. 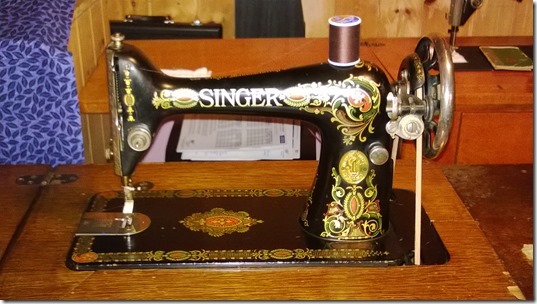 After all, it was an old, outdated sewing machine and I had my new, modern Singer. I loved my Singer sewing machine. 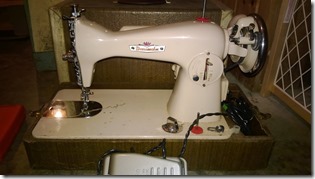 Over the years, I sewed tons of clothing on this machine – blouses for myself, my mom and my sisters, dresses for my daughter and I, shirts and suits for my husband and son, active wear for my nieces and nephews, flannel shirts for my brother, as well as many, many other craft projects and décor items. I even started my first quilt ever on my Singer Stylist. 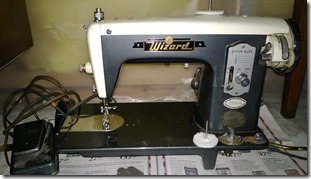 I used my little Singer sewing machine for nearly 40 years, until a plastic gear dry rotted and broke. I was nearly finished making my quilt, when it happened. Now I was without a sewing machine and I needed to finish my quilt. I picked up a “working” sewing machine at a yard sale and tried to use that, but it wouldn’t stitch correctly no matter what I did. I got another at different yard sale, but that didn’t work right either. Both of these machines were probably made in the 90’s or so. Finally, I went to Wal-Mart and bought an inexpensive Brother sewing machine. I just wanted something to make a straight stitch and allow me to finish my quilt. The Brother machine was light and slid around the table. I had a time trying to fit my queen size quilt through it. It was cheaply made and wasn’t designed for quilting. It did make a good straight stitch, but it was so light and flimsy as to be useless for my desired purpose. Alas, I would be able to finish my quilt! I excitedly sat down to finish putting in the final stitches of the quilting. I was dismayed to discover that my new “quilting” machine had a smaller throat than my old Singer had. It was very difficult to fit my queen sized quilt through the opening. Though the machine was heavier than the inexpensive Brother I had picked up, it was still much lighter than my Singer Stylist. It, too, slid across the table as I fed my quilt through the feed dogs. However, I loved the needle up/down feature and the easy needle threader. I had paid a fair amount of money for this new sewing machine, so I wasn’t ready to pass a harsh judgment on it, yet. Indeed, it did allow me to finish my quilt, which was very exciting for me. 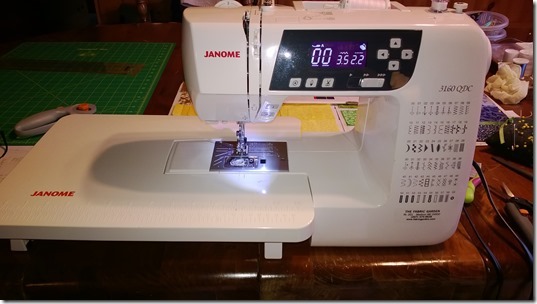 My experience with my old Singer, the newer Singers purchased at the yard sales, the new Brother, and the brand new modern Janome sewing machine, made me think about how machines had developed over the years. The memory of learning to sew on the old treadle sewing machine at my mom’s house, when I was a girl, returned to me. I had pushed the memory of using that old treadle machine so far back in my mind that I had practically forgotten about it. Suddenly, I wanted a treadle sewing machine. A couple of years ago, I happened to be in a quilt shop that was closing its doors. 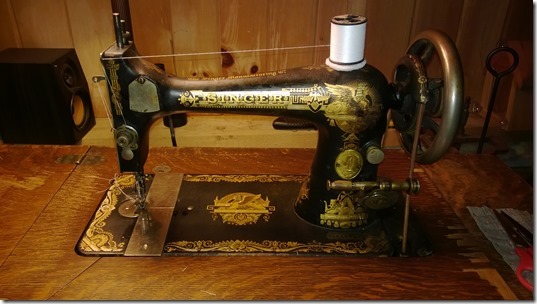 I saw a beautiful Red Eye treadle sewing machine the owner was selling for $150. After talking with my husband, I bought the machine. I brought it home and with my husband’s help, cleaned it, oiled it up, and got the belt onto it. When I went to wind a bobbin, I discovered the bobbin winder would stay out away from the wheel. The spring was broken. So I would a bobbin on my Janome and while my husband held the bobbin winder away from the wheel, I treadled the machine. It felt good and seemed very natural to me to be treadling. The machine stitched perfectly and I was absolutely amazed that this sewing machine, over one hundred years old, could still work so beautifully. But since the bobbin winder needed a spring, I set it aside until I could get it fixed. 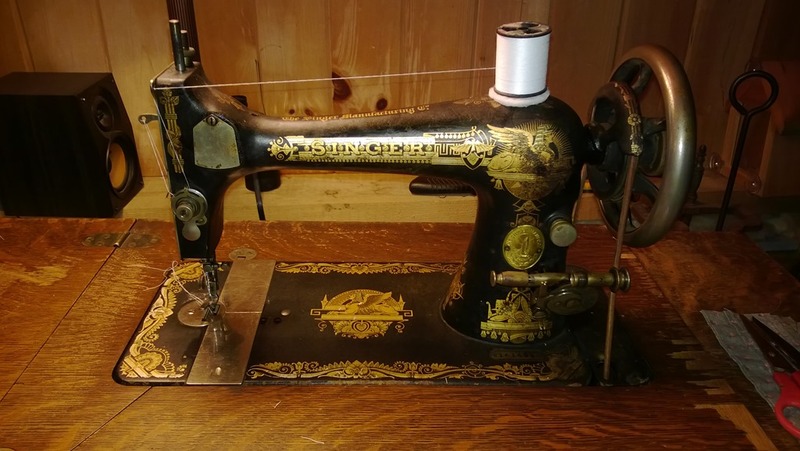 Over time, I picked up several more antique sewing machines varying in age from 130+ years to just over 50 years, a couple more treadles and a few electrics. In my travels, I picked up some newer electronic models, too. I soon discovered that the antique machines made before the 50’s were mostly metal, very heavy, and designed to last. The newer machines, from the 50’s on, were made with plastic parts, though earlier models still had a lot of metal in them. The newest, modern machines made today are mostly plastic with some metal parts. I think the most astounding thing I learned in collecting these machines is the term “planned obsolescence”. Planned obsolescence “in industrial design is a policy of planning or designing a product with an artificially limited useful life, so it will become obsolete, that is, unfashionable or no longer functional after a certain period of time.” (Wikipedia: https://en.wikipedia.org/wiki/Planned_obsolescence) Of course, planned obsolescence isn’t just used in making sewing machines, but in practically every product we see on the market, today. However, the idea that sewing machines once were made with the intention of long outliving their owners is astounding. The antique machines made before the 50’s are rock solid machines. It doesn’t matter how dirty or rusty they appear, almost every single one of them can be “brought back to life” by cleaning and oiling. Once you have them threaded correctly and with a new sewing machine needles, they will all make the most perfect stitches you ever saw. One of the machines I picked up was frozen solid. Parts of it were fused together so you could not turn the hand wheel. After several days/weeks of oiling and trying, suddenly the wheel moved. Gradually, the parts freed up so it spun freely. Anxiously, I threaded up the machine and tried it out on cloth. Perfect stitches again. It simply amazes me. Though I love my new, modern, computerized Janome 3160DQC sewing machine, it really isn’t a quilting machine as much as it is a piecing machine. The automatic thread cutter is a time saver and thread saver and the needle down/up feature helps in maintaining your place in a seam. However, the lack of throat space and the lightweight design serve to make the sewing machine less practical for use in actually quilting a full-size bed quilt. My 1975 Singer Stylist 534 is a still a very nice little machine, but its plastic parts that break make its life limited. Knowing that no matter if my modern machine breaks down or the power goes out for days I can sit down at my old treadle sewing machine and stitch pieces together for quilt tops or sew a blouse or even quilt a large quilt gives me such piece of mind and contentment. As I my feet work the treadle and my hands move the cloth through the feed dogs, I like to think about the hands of the first owner working the cloth and how she must have marveled at the “modern-ness” of this sewing machine, when it was new. I now own about a dozen antique sewing machines, three treadles and several electrics, most of them Singers. I have a few Singer Model 15 clones, which are very nice machines. The nicest thing about any of these old electric machines is the fact that I could take any one of them and put it in a treadle cabinet and treadle the machine because the motors and belts on them are all on the outside where you can access them. From the “newer antiques”, my favorites are a Wizard from Western Auto and a pink Dressmaker, Singer 15 clone. Incidentally, one of the antique machines I picked up was a 1904 Singer 27-4. 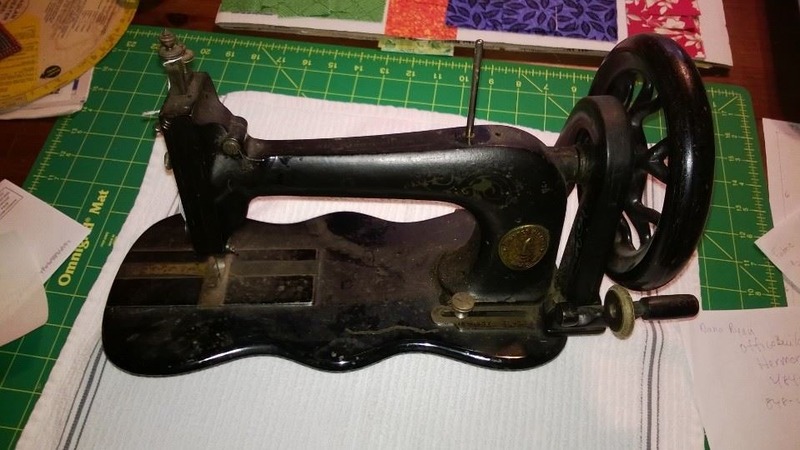 In using this sewing machine, I realized that the treadle I used as a little girl must have been a model 27 with the shuttle bobbin. As I sat down to try it out for the first time, winding the bobbin, inserting it, threading the machine – it all seemed second nature to me. And the machine, even though it is over 100 years old, makes perfect stitches. Though I don’t use the old machines very often, I take relish in their history and longevity. I am comforted by the fact that in the event of a power outage, I can still stitch anything I want. 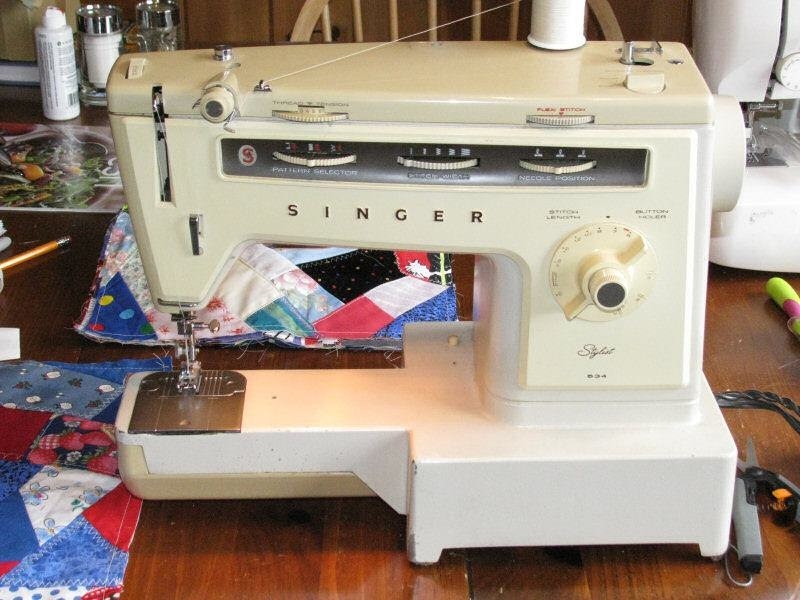 Whenever I want to step back in time, I sit down at the Singer 27-4 and make a few quilt blocks and think about the first person who owned her. The gentle clunk, clunk, clunk of the treadle working brings to mind the my days of own youth, sewing in my mother’s living room on her old treadle sewing machine. I sometimes ask myself, “Do I need all these old sewing machines?” My answer is this: No, I don’t need all these old sewing machines, but better they are here with me than in a landfill or melted down for their metal.